So, things have been a little busy for me lately, which should be obvious from my neglectful activities towards the blog. 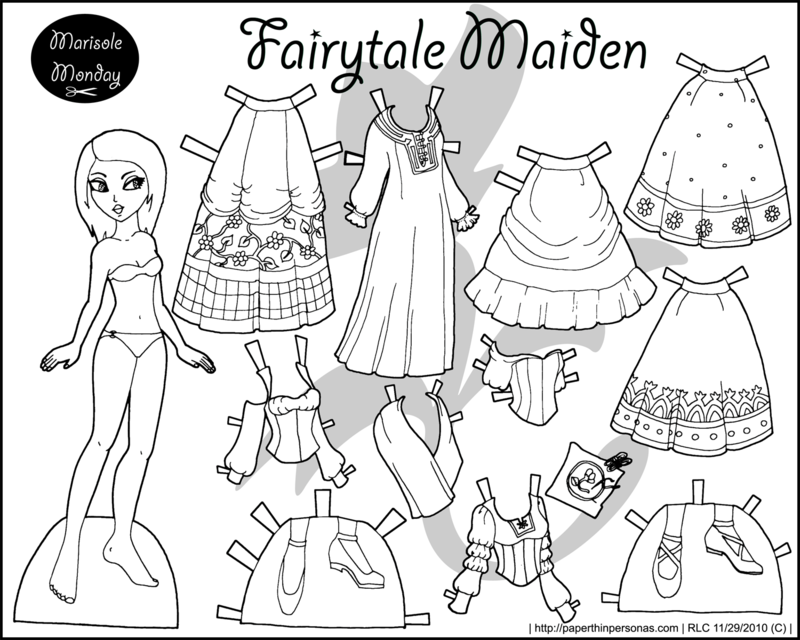 Anyway… to beg forgiveness today, I’ve got some paper doll princess coloring pages to print and play with. I never really know how to describe black and white paper dolls. Anyway, these are meant to be colored, so I think they are coloring pages as much as they are paper dolls. They’re all fairy tale/princess themed which I think is kinda fun, since they can all share clothing. The first one of is a Fairytale Maiden. Back when I posted her in color, I imagined she was a fairy tale princess in that stage of the story where she’s sent off to live with a kindly fairies and avoid spinning wheels OR before she meets the Prince while he’s out hunting. Her skirts are all meant to mix and match with her tops. Here’s this paper doll in full color, if you don’t want to color her. It’s fascinating to see how my art has changed since I created her back in 2010. Yellow Princess is maybe the most traditional of these paper doll princesses, I created her earlier this year. I wanted to draw princess dresses that were ruffled and fluffy and decorated with ribbons and lace which is totally what I think of when I think “princess.” Of all the paper dolls I’ve created, I think Yellow Princess is one of the most over the top. I kinda love her. Like any good princess, she has a crown and some awesome accessories. And here is this paper doll in color, very yellow and ruffled. I think she’d be fun to color… I sort of wish I’d done her in purple rather than yellow the first time. Perhaps now is my chance. 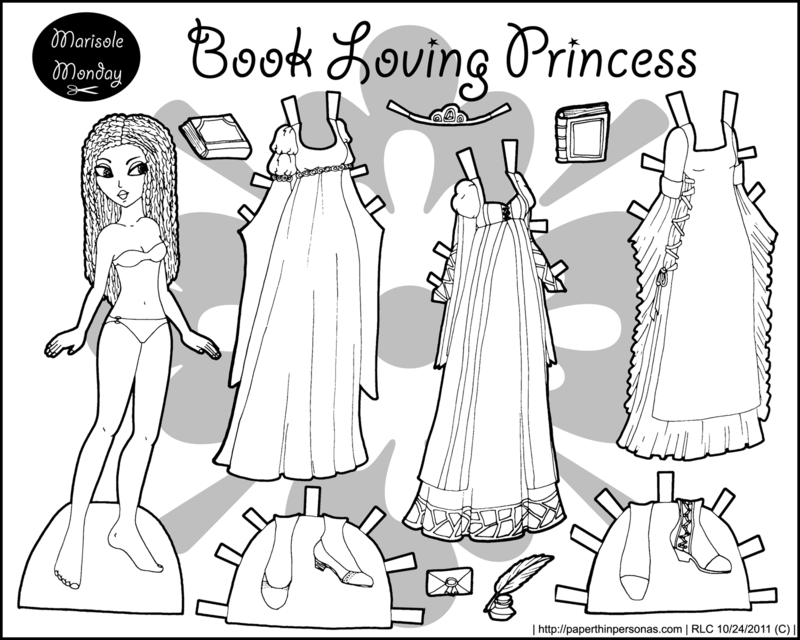 Our Book Loving Princess has a lot to do with my inability to come up with names for paper doll sets. (Embarassing, but true!) She’s got three dresses, books and book accessories like an ink pot. Her princess gowns are based on renaissance dresses. But only really vaguely, I mean… not trying to be accurate here in anyway. This princess paper doll in color is very red and yellow. She is awfully cute in color, I gotta say. My Elven Princess is one of my favorite sets. I love her gowns and shoes. The simple dress is supposed to be a nightgown for this paper doll, but I get that most people didn’t notice that when I first posted her. Here she is in color. Did I mention how much I love her trained skirts and her platform shoes? Cause I totally do. I hope these paper doll coloring pages make up a little for my absence these last two weeks. Wow. This is great. I’m so excited to see so many Marisole’s in black and white. Now I can’t wait to color all of these new ones. Thank you so much. these where some of my very favorite Marisol’s I am so excited to be able to color them! I am so excited ! I’m so glad you’re excited, Meredith. I’m really excited about it as well. Thank you! My daughter loves Marisol! She loves to print a dozen so she can make her dresses many different colors. I’m trying to offer more black and white options for the paper dolls in the future. I’m glad you daughter likes them so much. I love ALL of they’re hair, and I had had NO idea that the slim dress in An Elven Princess was a nightgown….